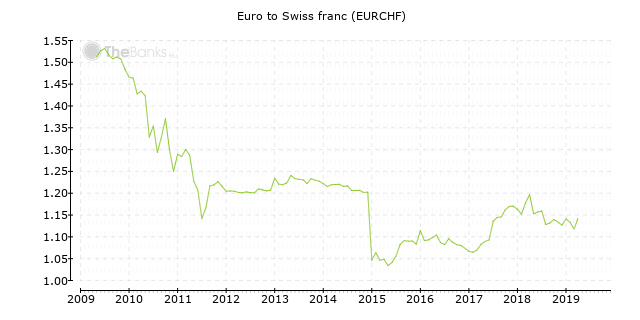 During the last 11 years EURCHF exchange rate was within the range 1.0341 - 1.6354, reaching its maximum in Jul 2008 and falling to its minimum in May 2015. Chart 1. Euro to Swiss franc (EURCHF). Source: ECB. According to Eurostat, nominal GDP of Switzerland in 2017 was 601.0 bln EUR. Switzerland underperforms the European Union in terms of real GDP growth with	the average annual differential coming to -0.2%	over the past 10 years (2007 - 2017). In 2017 real GDP growth was 1.0% which was below the Euro Area average (2.3%) and below the European Union average (2.4%). Real GDP growth in 2018 - 2023 are IMF's estimates. Chart 2. 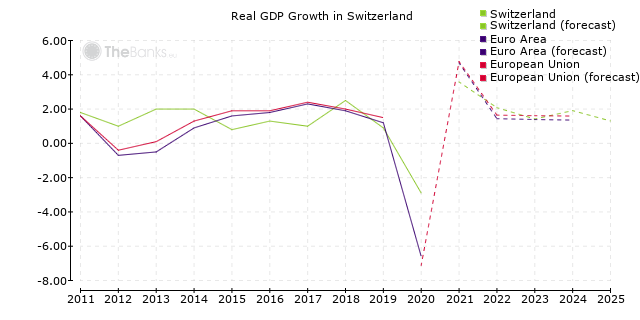 Real GDP Growth in Switzerland. Source: Eurostat, International Monetary Fund. In 2016, nominal GDP per capita in Switzerland was 72 200 EUR. 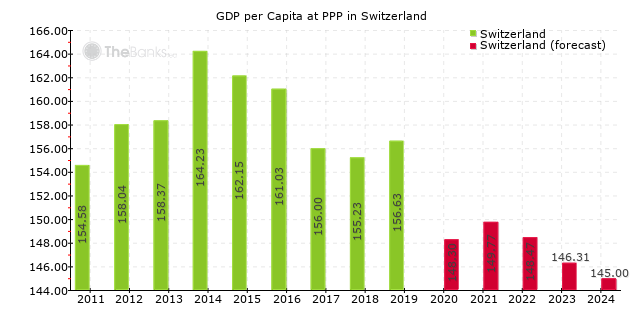 Switzerland has an above-average level of wealth in terms of per-capita GDP	at purchasing power parity (PPP); this economic welfare indicator has, on average,	exceeded that of the European Union by 45.0% over the past	10 years (2006 - 2016). GDP per capita at PPP in 2017 - 2023 are IMF's estimates. Chart 3. GDP Per Capita at Purchasing Power Parity in Switzerland; European Union = 100. According to Eurostat, inflation rate in Switzerland in 2017	expressed as annual percentages of average consumer prices was 0.6% which was below the Euro Area average (1.5%) and below the European Union average (1.7%). Inflation rates in 2018 - 2023 are IMF's estimates. Chart 4. 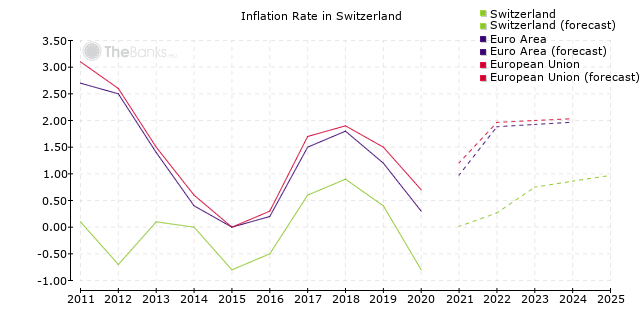 Inflation Rate in Switzerland. Source: Eurostat, International Monetary Fund. According to , unemployment rate in Switzerland in 2017 was 3.2% which was below the Euro Area average (9.1%) and below the European Union average (7.6%). Unemployment rates in 2018 - 2023 are IMF's estimates. Chart 5. 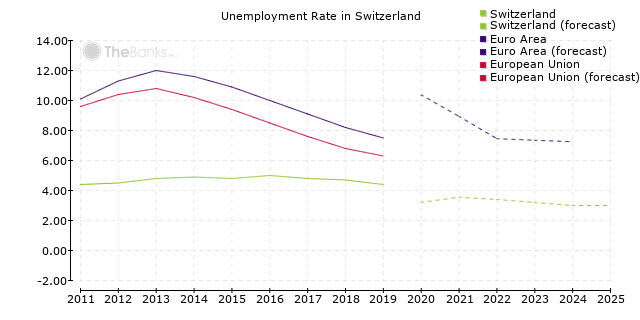 Unemployment Rate in Switzerland. Source: International Monetary Fund. Switzerland has sovereign credit ratings assigned by Fitch and Moody's: the rating set by Fitch is AAA (highest credit quality), outlook stable; the rating set by Moody's is Aaa (prime), outlook stable.